We Go to Orvieto and Beyond | Sprezzatura, Y'all! 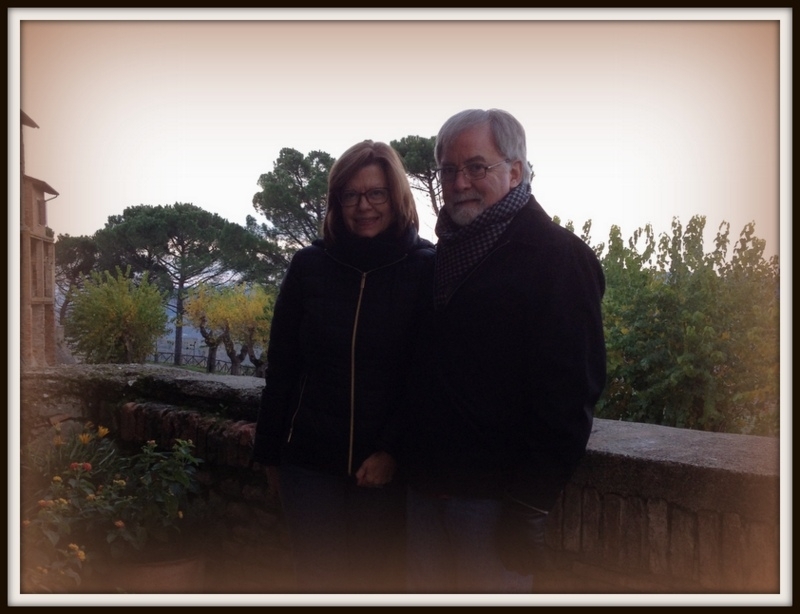 We spent a couple of nights with Tim and Julie near Orvieto. We stayed in an amazing place with incredible views. It was out in the country about a 15 minute drive from Orvieto. We got in after dark, so all we could see were the lights from the city. But the next morning we got a great view of the city being engulfed by clouds. It was a gorgeous sight. It looked like the town was floating on a cloud – kind of like an Italian Shangri-la. Despite the blue peeking through the clouds in the morning, the clouds won and the day was cloudy and rainy. Since we only had two days there, we soldiered on and went about our agenda. First up, we visited Civita di Bagnoregio, dubbed the dying town by its favorite son, Saint Bonaventure. Founded by the Etruscans more than 2,500 years ago, Civita di Bagnoregio is a dramatic punctuation mark on an eroding mountain. Built on volcanic tufa upon a foundation of crumbling clay, time and the elements have slowly eaten away at it from the outside in. Parts of it have fallen off the mountainside, including Saint Bonaventure’s home. What remains is a genuine treasure – mostly untouched and pristine. You get a real sense of antiquity here. The main piazza is dirt, not paved like the ones in the fancy hill towns. You look at it and think, well, yeah, that’s what it would have been back when it was constructed. You walk to the edge of town and look straight down into an abyss, feeling a little suspended in air and a little teetering on the edge of the world. Few people live here now, understandably, so it has an almost ghost-like quality. Tourism is big here, so there are a few shops and restaurants, I even saw some rooms for rent. There’s an etruscan cave that you can tour. That’s about it. You enter from a long footbridge that leads you through an etruscan arch and from there you wander the ancient streets and mingle with the 10 or so full-time residents and wonder how long it will be here. Efforts are underway to try and stabilize it, but earthquakes, landslides and plain old wind and rain are serious threats. And the tourists keep coming, making you wonder if that’s good or bad. Can it withstand that much stress? Will popularity and notoriety help the efforts to preserve it? It’s a wonderfully unique place that offers an unadulterated glimpse into the past. I hope it lasts, but like Venice, its charm may also be its demise. After a wonderful lunch in nearby Bagnoregio, the prospering big brother to Civita, we strolled around Orvieto for a while. 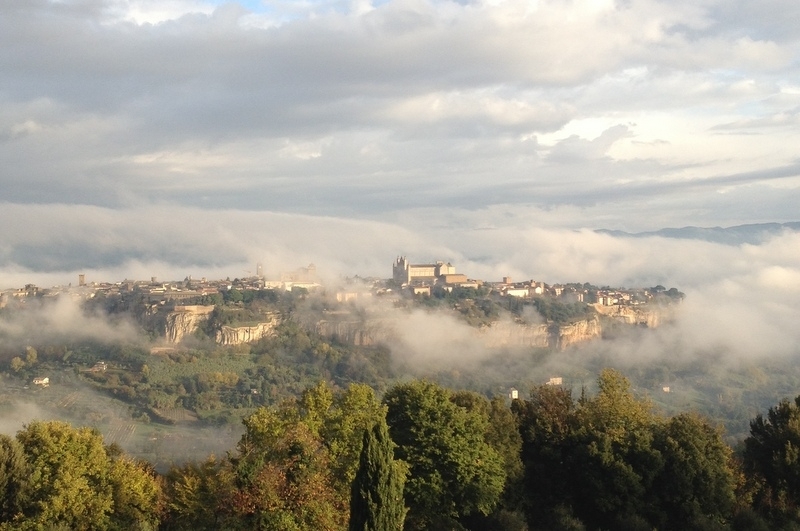 Orvieto, also built on volcanic tufa, has been a major presence since Etruscan times. It has a rich and storied past and remains a significant city today. What a difference between crumbling little Civita and bustling Orvieto. Orvieto is full of shops, restaurants, and hotels. It also has a wonderful duomo, that I’ve talked about in another blog post and won’t repeat here (See We End up in Rome). It’s a tourist’s paradise. It’s a fair sized city and is very walkable, offering great views and many shopping opportunities. You have to wonder why it stayed intact and Civita didn’t. After all this pondering and walking, we were ready for a good dinner. We went back our country house and didn’t want to drive back in to Orvieto for dinner so our hosts recommended a little place nearby. They called ahead to make sure they were open and we were off. We’re not sure if they opened just for us, but we were the only people in there and got first class service. It was a really cool place with, you guessed it, Etruscan caves underneath. The Etruscans really got around this area. We had a wonderful dinner and were entertained by the owners. The best wine – thanks Barbara! The next day was bright and sunny – clear blue skies. No fog, no clouds, no rain. We meandered around Umbria and Tuscany and ended up in Pienza for lunch. Pienza is one of the most picture perfect towns you can imagine. Very small, you can walk the entire town in about 20 minutes. It has a walk around the city walls that offers incredible views over the countryside. The perfect place to linger for a while and have a nice lunch. It was a great couple of days seeing new things and being with dear friends. Italy is great on your own, but it’s even better with friends. They see things you don’t see and offer perspectives that you might not have thought of. It emphasizes why we’re drawn to certain people and how much better they make our lives. We’ve been lucky to have several friends come and share this journey with us and that makes it much more memorable. Tim and Julie have been here many times and much of what we’ve done with them has been revisiting places we love, like Orvieto and Pienza. 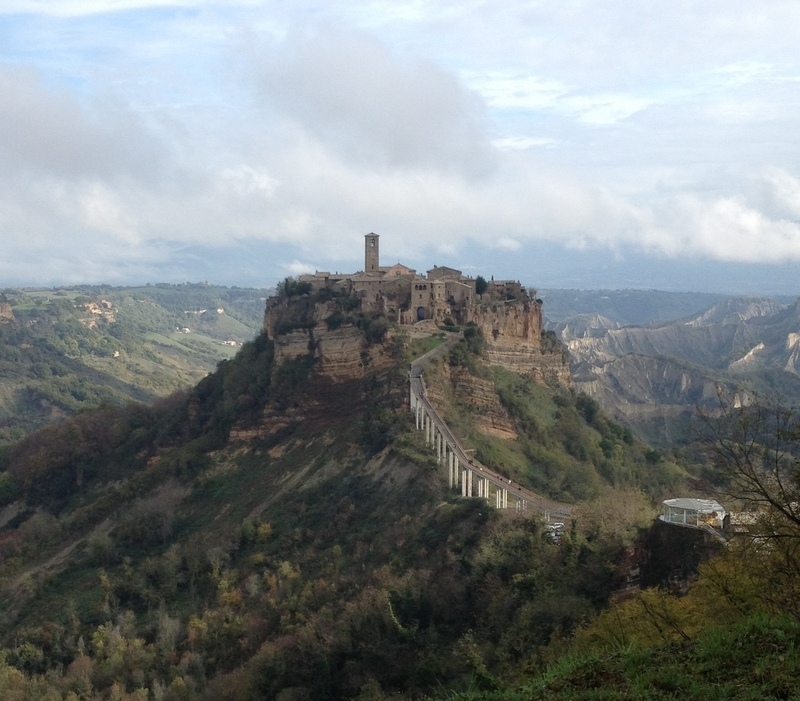 We’ve also seen new things, like Civita di Bagnoregio. So we continue our great Italian adventure with our friends and wake up every day wondering what memories we’ll make.